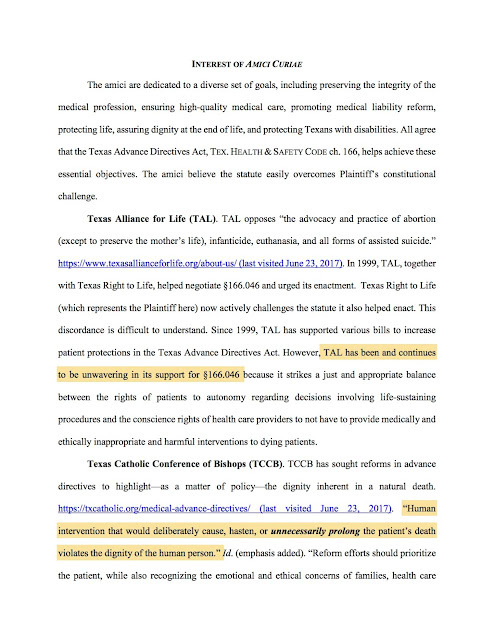 In the wake of the Texas Catholic Conference of Bishops' ("TCCB" or "TCC") "Parish Advisory" (see this post) seeking to ban Texas Right to Life ("TxRTL") from parish properties statewide, embargoing any information coming from them in order to keep it from Catholics, and making all sorts of allegations against it for which there factual support is still entirely lacking (and I'm not the only one who has been asking for it), various questions have arisen. One is where the TCCB stands on certain matters, including the Texas Advance Directives Act ("TADA") to which this blog has been almost entirely dedicated. The Parish Advisory mentions in Issue 2 "Conflicts on end-of-life reform" but that is code for TADA. I have been asked how I can claim that the TCC supports TADA, and, therefore, involuntary passive euthanasia of patients. What evidence do I have? Well, first, I have covered it on this blog for four years (but it has been going on much longer than that) and below I catalog and summarize prior posts on all of these matters for you. 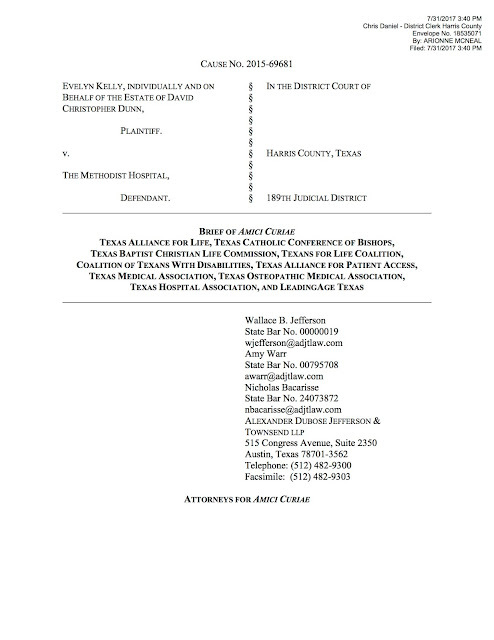 Second, I'm presenting here the Amici Curiae brief that the TCCB and other organizations filed supporting TADA in a lawsuit brought to challenge its application to a patient and its constitutionality. In their own words, they explain their support of TADA and all it stands for. Let me begin with a note about terminology. I've discussed this before but let me recap. Why do I refer to TADA as "involuntary passive euthanasia"? First, TADA allows a hospital to withdraw your life-sustaining care against your will; it does not require anyone to consider your thoughts on the matter at all. Thus, if it is used against you against your will, you are subjected to something that is involuntary. Second, "passive euthanasia" is distinguished from "active euthanasia." "Passive euthanasia"is death brought about by the denial of something without which you will die. It can be air (ventilators), nutrition, hydration, etc. "Active euthanasia," on the other hand, is that which Jack Kevorkian promoted - a shot or pills, etc. are administered - to directly and quickly bring about your death. TADA allows for passive, but not active euthanasia. But allowing the one sets up a slippery slope. There have already been calls to allow active euthanasia in Texas. One other term should be addressed as well. This dispute has been characterized as being about "end-of-life" reform or legislation. Understand that in some cases the patient is not at the end of their lives. Often the issue is a refusal to treat a patient with a serious illness, a need for medical intervention to sustain their lives (but who might live a long time if treatment is not denied), a person with a disability, or even someone who suffered a serious traumatic injury and just needs more time to heal, and who might make a full recovery. It is simpler and maybe "cleaner" for some to characterize such people as always being at death's door; a person who someone is trying to keep alive at all costs in some hopeless, cruel endeavor meant to only cause suffering so that the clueless, distraught family doesn't have to "face reality." That paints a narrative where euthanasia seems the humane thing (even if it were moral). The truth is, there is a great deal of discrimination here against those with disabilities or medical needs that are not otherwise "terminal." The situation is not so unlike the exception in Texas allowing abortion of unborn babies diagnosed with "fetal abnormalities" at all points in the pregnancy even after the important 20 week gestational age when science proves that babies can feel pain. Certain Republicans (not endorsed by TxRTL, of course) refused to even consider an amendment to a bill that would have closed this loophole and prohibited all abortions after 20 weeks. Babies diagnosed with "fetal abnormalities" do not have the same right to life in Texas even among certain "pro-life" Republicans. There is great discrimination in existence here against those with disabilities from womb to tomb including among those who call themselves pro-life. Think about that. Concerning the matter at hand, I have publicly stated that the TCCB supports TADA and I have received some flack and pushback from people, who I am sure are well-meaning, but refuse to believe that their Bishops could err (clericalism is an error, by the way) and have demanded proof that the TCCB supports involuntary passive euthanasia and/or TADA. Although this proof exists in the statements made in the Parish Advisory itself coupled with the language of TADA, some are not convinced. this post (where I describe yet another experience I had while attending a hospital medical ethics committee hearing seeking to withdraw a patient's life-sustaining care in order to hasten his death and note, among other things, that two of the members SLEPT during the proceedings). 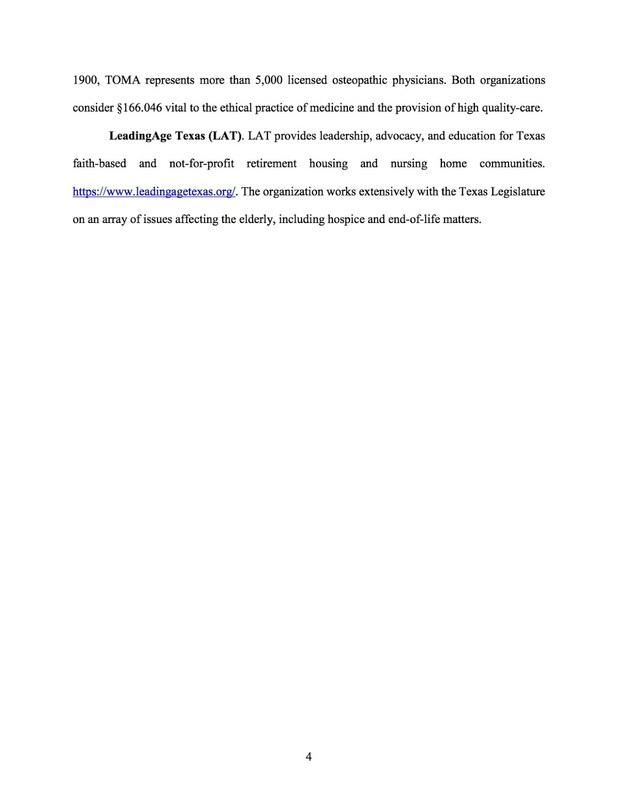 NOTE: The Parish Advisory stated: "Texas Right to Life is not to be confused with Texas Alliance for Life or Texans for Life Coalition, which are separate organizations and remain consistent with the bishops' positions." (Emphasis added.) Thus, TAL and TLC were given a robust, unqualified, absolute endorsement in the Parish Advisory. That will become more significant as we delve deeper into the substance. Then, significantly for the purpose of this blog, I want you to see the stated "Interest of Amici Curiae" - in other words, the organizations' explanations to the Court for why they believe they have an interest in this litigation and why the court should listen to what they have to say. I'll present each of the four pages and then comment below. So there you have it. 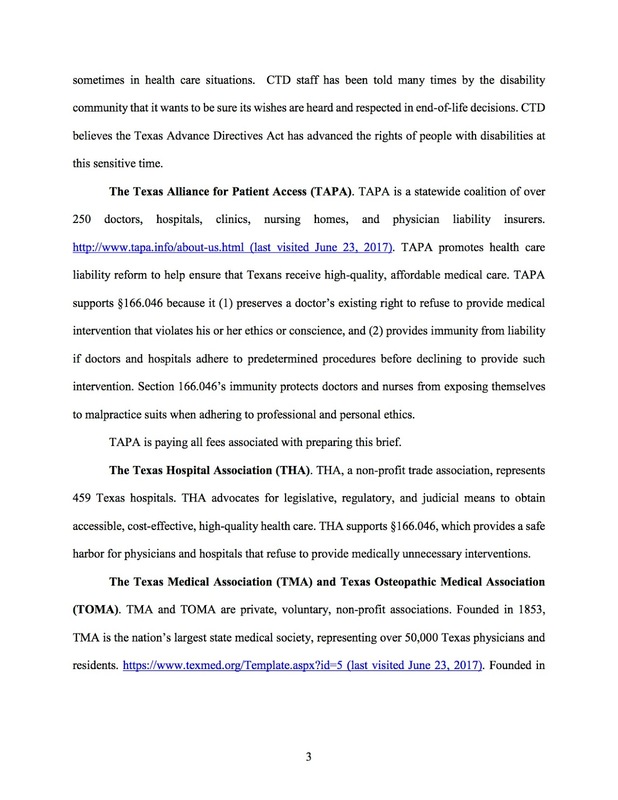 The TCCB, TAL, and TLC have each come out in support of TADA in a brief opposing the constitutional challenge to the law which gives you - the patient - no due process rights. None whatsoever. TLC goes further and says you have no Constitutional right to medical care at all! So if medical care is required to sustain your life, you have no Constitutional right to life by this logic. Good to know. Also, and this is relevant, the executive director of TLC, Kyleen Wright gave this testimony in support of using aborted baby tissue for research so long as the women know what will happen to their babies' bodies. NOTE: The Parish Advisory stated: "Texas Right to Life is not to be confused with Texas Alliance for Life or Texans for Life Coalition, which are separate organizations and remain consistent with the bishops' positions." (Emphasis added.) Arguably then, these are the positions of the TCCB. There were no qualifications given to the absolute TCCB endorsement of these organizations and what they stand for. The Catholic Church does not support using aborted baby remains for medical research. Apparently, the TCCB does. Do you see why the TCCB, and Bishop Olson in particular, are in need of both correction and to meet with someone else on these matters? It simply cannot be said that a patient's rights are "balanced" in a law that provides them with no rights at all. Read the law. Google what is required by due process. Then read the law again. As I have discussed in various posts above it is patently false to claim any sort of balance between patient and doctor rights, due process protection, constitutionality, or morality under Catholic Church doctrine. Balance is not just lacking, it is non-existent. The TCCB is actively opposing the death penalty in Texas. While I make no statement on the morality of that, it is important to note here the irony: people on death row received full due process rights - both substantive and procedural - that the ill patient in the hospital is entirely denied by the law that the TCCB claims is "indispensable for ensuring dignity at the end of life." The convicted felon has a right to appeal his conviction, any denial of due process rights, etc. The TCCB supports the denial of due process rights for the ill patient but cries out to the Heavens for the convicted criminal who received those very rights TADA and the TCCB (and TAL and TLC) deny to the ill. How does this make sense? There is so much wrong with this letter [from the TCCB in 2014], but a few things occurred to me immediately. It refers to “unnecessarily prolong[ing] a patient’s death…” as a reason to withdraw care. Such is an awkwardly worded statement that literally makes no sense. The definition of prolong is “to extend the duration of,” but we cannot extend the duration of death. Once you die it’s done; this earthly life is over. It seems to me that what they are saying is that they don’t want to unnecessarily prolong a patient’s life. Also, and this cannot be stated enough, I have never gone into a hospital ethics committee hearing and had doctors complain that their consciences were violated by continuing life-sustaining treatment, nor has anyone else I've ever talked to that has attended one. Doctors and advocates of the institution of involuntary passive euthanasia for a patient have, however, stated (in front of the family) if the patient were in a forest and had been still that long, he would have been eaten. I wrote about this experience here and used it as part of my testimony before a legislative committee hearing on TADA. Doctors have said that this person was "gone" and would never be the same; that the person the family knew had left. These are quality of life determinations made by people utterly unqualified to do so. No one is qualified to make that decision for you but you or your chosen surrogate. 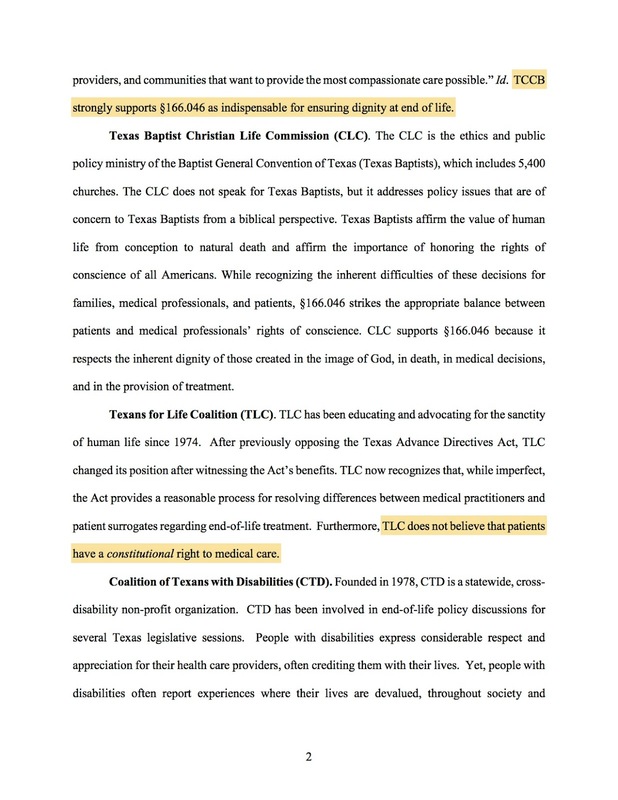 NOTE AGAIN: The Parish Advisory stated: "Texas Right to Life is not to be confused with Texas Alliance for Life or Texans for Life Coalition, which are separate organizations and remain consistent with the bishops' positions." (Emphasis added.) Arguably then, this is the position of the TCCB. Taking action to alleviate "suffering" (as opposed to the reasons set forth in CCC 2278) is euthanasia which is not supported by the Catholic Church. Doing this against a patient's will is also not supported by the Church. Yet, this this is the position of TAL and TAL's positions, according to this most recent Parish Advisory of the TCCB, are "consistent with the bishops' positions." The TCCB - thankfully - does not go so far as to say these are consistent the the Church's position. This is a distinction with an important difference as this situation makes painfully clear. Incidentally, there was no factual evidence that Dunn was suffering from his life-sustaining care, even were that a justification to pull the plug on him early against his will. Moreover, he prayed for his life as evidenced by the video of him. Moreover, this is all beside the point because a hospital should not be making the decision for you as to whether your death is hastened by the withdrawal of life-sustaining care or not. That is yours and yours alone. And, should you argue that life-sustaining care is not natural, you should know that the hospital in Chris Dunn's case argued that as they did not withdraw his life-sutaining care, his death was "natural." As I have argued before, if a doctor's conscience is pricked by allowing you to continue your life-sustaining care as your underlying disease, illness, or infirmity consumes you and leads you to a natural death, then why can he not step aside and allow another doctor to take over? Why must the fulfillment of his conscience lead to your hastened death? Your only option under TADA is to, in a maximum of 10 days, find a new facility (which is very difficult and usually impossible to do once the current hospital has made a futility finding) or the hospital can then withdraw your life-sustaining care against your will and hasten your death. You are completely at their mercy. It says that "[t]he decisions should be made by the patient if he is competent and able or, if not, by those legally entitled to act for the patient, whose reasonable will and legitimate interests must always be respected." (Emphasis added.) That in no way supports TADA, involuntary passive euthanasia, or its lack of due process rights. End-of-life legislation could actually be pro-life - it could actually promote the value and dignity of each life until a person's natural death, but that has been a difficult task - because of the TCC, TAL, and TLC (which has gone back and forth on TADA). Finally, I have been asked what the difference is between the TCCB and TxRTL on end-of-life (and I'd add to this refusal to treat) issues. I do not speak for TxRTL at all. I do not have that authority. My view of the difference between the two organizations is based on my own observations, statements by the organizations, review of their written works, testimony before the legislature, etc. With that caveat, as I see it, TxRTL wants, at a minimum, the patient's will to be upheld which, if we persist in having a law like TADA, should at least require due process rights for ill patients in hospitals so that a decision may not be made to withdraw their life-sustaining treatment against their will in a bid to hasten their death because someone else has decided that their life has no value, no quality, and is futile. Ideally, this would require a hospital to treat until a patient could be transferred to another facility willing to continue that patient's life-sustaining treatment until their underlying condition (if any) results in their natural death or until natural death otherwise occurs. 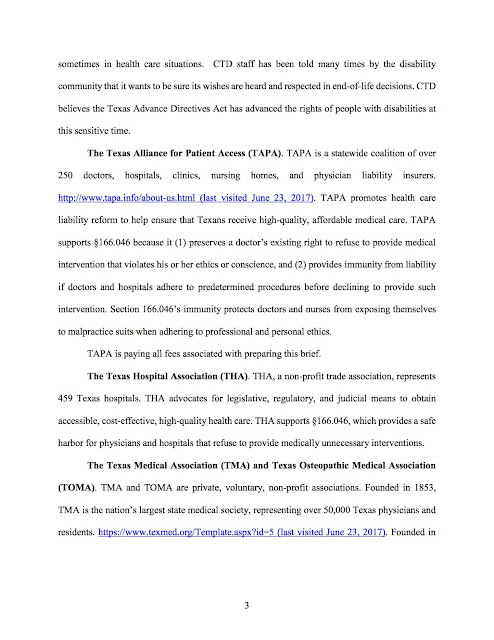 The TCCB supports TADA as a "balance of patient autonomy and [ ] physician conscience protection." See Parish Advisory at par. 2. The TCCB, as noted above in their Amici Curiae brief, "strongly supports §166.046 as indispensable for ensuring dignity at the end of life." Id. at 2. As noted, the TCCB sees "unnecessarily prolong[ing] the patient's death [as] violat[ive of] the dignity of the human person." Id. at 1. The TCCB has opposed such reforms as treatment until transfer and in the otherwise fatally flawed SB 303 faux TADA reform bill in 2013, and would only agree to extend the time to transfer from 10 to 14 days. Gee, thanks. 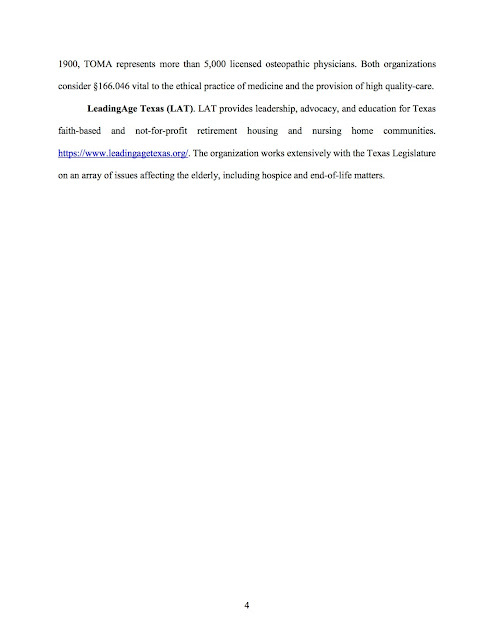 TxRTL, as I see it, does not believe that TADA provides any patient autonomy at all and therefore provides no "balance" between that and doctor conscience. It is important to note that there is a difference between life-sustaining care and life-saving care. This is not a call to provide what the Church has called "extraordinary measures." It is not chemotherapy or radiation or such treatments. Rather it is "basic" care such as artificially administered nutrition and hydration or even ventilators; oxygen, like food and water, is necessary to life. (Since the removal of artificially administered nutrition and hydration has been tightened up, I have personally seen an increase in hospitals wanting to remove ventilators from patients to hasten their death now.) Primarily, I believe that TxRTL sees the patient's wishes as paramount and does not see why there cannot be real balance between doctors and patients without the patient's hastened death through the premature withdrawal of life-sustaining care being necessary. So now you have yet more evidence as to the TCCB's support of TADA and the nature of the dispute. I renew my request to Bishop Olson to meet with me to discuss these matters. I submit that the evidence is overwhelming that he has not been well-served by his advisors on these matters. This Advisory is just an example of the problems in the TCCB and the Church as a whole. As I have said, this should be the genesis of a larger movement to take back our troubled Church. Indeed, it has been suggested to me that I may actually have a moral obligations to do what I am doing. And so do the rest of you! According to the knowledge, competence, and prestige which they ["the Christian faithful" or laity] possess, they have the right and even at times the duty to manifest to the sacred pastors their opinion on matters which pertain to the good of the Church and to make their opinion known to the rest of the Christian faithful, without prejudice toward their pastors, and attentive to the common advantage and the dignity of persons. Please call, email, tweet, or mail Bishop Olson and respectfully request that he meet with me to discuss these issues that affect us all, Catholic or not.